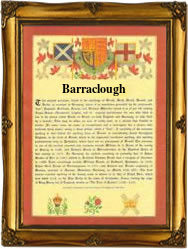 This name is of English locational origin, from the place called "Barrowclough" near Halifax in West Yorkshire. The derivation of the placename is from the Old English pre 7th Century "beara", meaning grove, or wood and "cloh", ravine or precipitous slope. Locational names were distributed around the country when those who bore the name moved from their original homes and went to live or work in another town or village, becoming known as "of Barraclough", to "Barrowcliff(e)" and "Berrycloth". One Elizabeth, daughter of Robert Barraclough, was christened on September 10th 1587 at St. Margaret's, Westminster, and Mary, daughter of Richard Barraclough, was christened on October 2nd 1650, at St. John's, Hackney, London. One William Smith married Ann Barraclough in Canterbury in 1690. The first recorded spelling of the family name is shown to be that of Peter del Baricloughe, which was dated 1315, Court Rolls of the Manor of Wakefield, Yorkshire, during the reign of King Edward 11, "Edward of Caernafon", 1307 - 1327. Surnames became necessary when governments introduced personal taxation. In England this was known as Poll Tax. Throughout the centuries, surnames in every country have continued to "develop" often leading to astonishing variants of the original spelling.